Heloderma horridum is a spectacle to behold. The size and sheer beauty of this lizard are more than enough to make any intermediate to experienced herp keeper fascinated. Though it is a venomous reptile and its scientific name means “horrible studded lizard”, it is a true showpiece. Heloderma horridum’s scales are small, beadlike, and not overlapping. 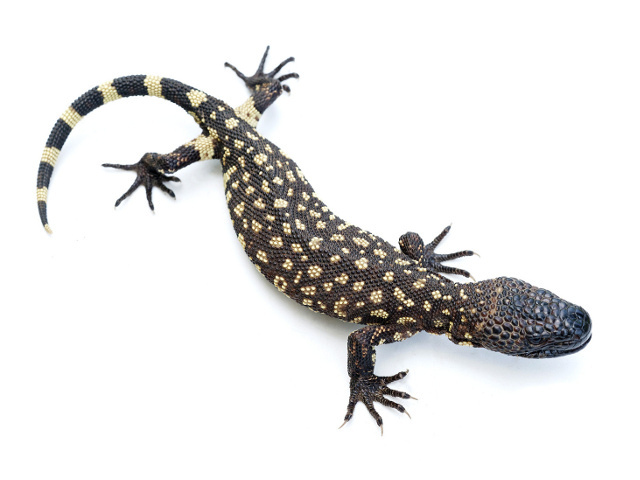 Except for the lizard’s underside, the majority of its scales are underlaid with bony osteoderms. Their base color is black and marked with varying amounts of yellow spots or bands, with the exception of H. h. alvarezi, which tends to be all black in color. Heloderma horridum are fairly easy to keep. Neonates should be kept in a shoe box rack type system for better monitoring. A good size of enclosure for an adult Heloderma horridum would be 1.5 x 0.7 x 0.5 meters (5 x 2.3 x 1.6 feet). Stay away from open-mesh enclosures as these lizards must be kept warm and, unless you live in a consistently warm environment yourself, it will be costly and complicated to get such an enclosure heated to the proper temperature. You can decorate your enclosure with logs or thick plastic tubes in order for your Heloderma suspectum to feel secure hiding under or inside them. Helodermas are known to spend a lot of time in burrows. It’s a good idea to replicate this in captivity in order to stimulate their natural behavior. They would need a cooler (a few degrees lower temps than the vivarium), dark container filled with soil or coir for humidity. So a good way of achieving this would be a plastic storage box (black or some other dark colour) preferably outside of the vivarium because it needs to be cooler and a 100mm plastic tube joining it to the vivarium so the Heloderma can access it as it wants. That way they can get the seclusion they desire and dig to their hearts content, and as a bonus, your carefully designed and landscaped vivarium might stay in one piece longer! Heloderma are messy animals, so keeping them dry and clean are the major objectives. You want enough substrate material to absorb the moisture of the feces until you can clean, but not so much that you cannot find the feces or any uneaten food item. I use newspaper for the neonates and aspen bedding for the adults. It’s always recommended to provide natural daylight cycle according to the time of year in your enclosures. Ambient temperature of your enclosure should be around 24-27 °C (75 – 80 °F) with a hot spot of 32 °C (88 °F) at the one end of your enclosure. This can be achieved with numerous ways and it’s always advised to monitor your temperatures with a thermostat in order to keep your animal safe. Fresh water is offered daily and must be maintain clean. Make sure that the bowl is big enough so that the lizard will be able to soak inside. Humidity must range between 40-60%. A large water bowl in the enclosure will achieve that. I feed all my babies about every four to five days. Pink or fuzzy mice live or dead no matter, as the animal grows i increase the size of the food item. If an animal regurges soak in lukewarm water daily for about one hour (DO NOT FEED !) for seven to ten days then feed a very small meal and work back up. I feed my adult Heloderma horridum primarily large mice; males once per week and females twice per week. DO NOT FEED EGGS NOT NECESSARY. Eggs can be used to get WC confiscation or rescue to feed that’s the only time I use egg. Baby Heloderma lizards should be handled with Forceps or with leather gardening gloves. They will bite and can hurt you. NEVER grab a Heloderma lizard behind the head this can make the animal very scarred and aggressive and will create a nasty adult. If you use forceps and pick them up gently as the grove large they tend to calm down and are very handleable. They are Venomous and a bite can cause severe swelling pain vomiting and sometimes loss of bodily functions. Not considered lethal but avoid getting bitten at all costs. Adult horridum can be picked up by the tail. When picking up a tame adult lift the tail and slip your hand up under its belly around its front legs. They can whip around up and side to side but not to well down. Heloderma are hardy and if using Sani Chips or fine pine bedding the cage can be spot cleaned twice per week and I do a whole bedding change monthly. For Neonates news paper and water should be changed two to three times per week. While Heloderma Lizards are growing the shed constantly usually in pieces the large water bowl helps with this process. Sometimes Beaded Lizards get gut problems which can cause them to regurgitate. I use Orbax solution every other day for five treatments along with Metronidazole. This seems to clear most stomach problems up. Illness in Heloderma is very uncommon. Ceftazadime for injection and hydration can also work on sick Heloderma. A little extra heat say 29-31 °C (84-88 °F) and hydration are optimal if these things don’t work there’s usually nothing else you can do. That being said Heloderma is a very hardy captive and has few health problems.